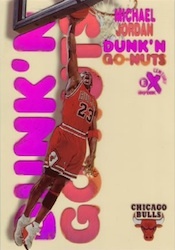 When talking about the most popular basketball cards in the hobby, it is hard not to mention one of the many Michael Jordan inserts. During MJ's rise to stardom, the basketball collecting world was a much different place than it is now. The no-frills, no-thrills style of late-80s and early-90s products gave way to the insert craze of the mid-to-late 90s. Card makers went through an unprecedented era of experimentation with new card technologies, adding further intrigue to the chase. These factors helped make Michael Jordan the undisputed king of the cardboard. Despite his retirement more than a decade ago, Michael Jordan inserts, especially those from the late 1990s, have taken off. For many, their values continue to climb. Several of the most popular inserts have even been brought back for a new generation of collectors with their usage in 2011-12 Fleer Retro Basketball. Products like this, combined with the original Michael Jordan inserts, make it a certainty that these cards will continue to help drive the hobby. 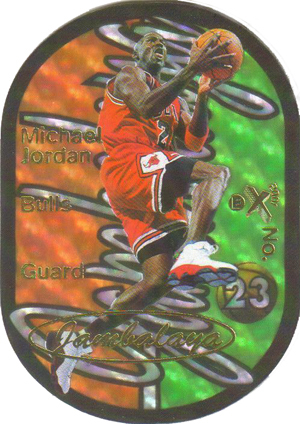 Get a real-time look at the 50 hottest Michael Jordan cards currently listed on eBay. 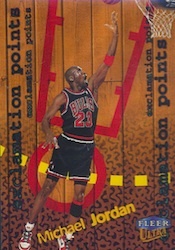 The following list aims to catalog some of the best Michael Jordan inserts. 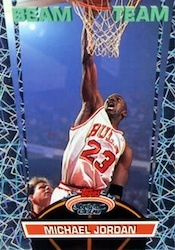 Given the sheer volume of popular Michael Jordan cards, several constraints were added, with the main one being no parallels. Therefore, cards like PMGs (Precious Metal Gems) were not included on this list despite their importance to basketball collecting and the hobby in general. Autographs and memorabilia cards were also left off this list. One of the first Michael Jordan inserts, these stickers are actually not too difficult to pull. Overall they fall one per pack with just 11 different stickers in the set. However, popularity and time have pushed the values up for this card and it remains highly desirable. 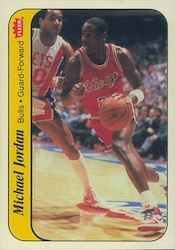 It also helps that the insert was found in Jordan's main rookie card product, 1986-87 Fleer Basketball. 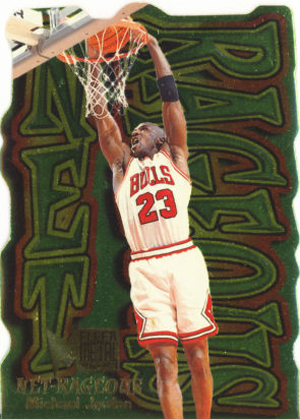 Beam Team is one of the least valuable Michael Jordan inserts on this list but its relevance is felt in the attention it received from collectors when it first emerged. The laser show border design pays tribute to the popular NBA halftime show that ran during the second half of the 1992-93 season. Collectors should be aware that there is a "Members Only" version that was sold as a set and is distinguished by a "Members Only" watermark. Regular Beam Team cards fall 1:36 packs of 1992-93 Stadium Club Basketball. With 21 cards in the set, finding an MJ shouldn't be too tough of a task. 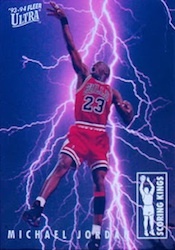 One of the more unappreciated inserts on the list, 1993-94 Fleer Ultra Scoring Kings utilizes foil and a post-shot image of Michael Jordan to present a classic but powerful design. Plus, who doesn't like huge lightning bolts? This electric card could normally be pulled from a modest 360 packs once you factor in the 1:36 odds for the ten-card set. Arguably one of the ugliest Michael Jordan inserts, 3D or otherwise, Flair Hot Numbers is proof that Jordan can make anything valuable. To say this card is rare would be an understatement. 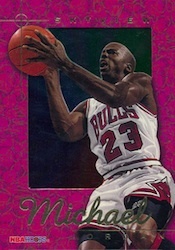 With cards from the ten-card set dropping at 1:480 packs, this Michael Jordan insert does not come up often. Despite its rarity, high-grade versions of the card only sell in the $200 range. Perhaps this is because the cut out image of Jordan is more reminiscence of an alien than the greatest basketball player of all-time. Although die-cuts had been a common feature in card design for decades, 1996-97 E-X2000 A Cut Above shows how unique and intricate this process has become. Like many of the Michael Jordan inserts, this card is not a common pull. 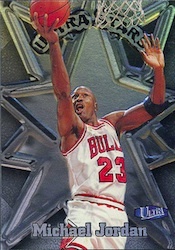 Stated odds for the ten-card set are 1:288 packs, which means this Jordan card only comes around every 2,880 packs. Another interesting die-cut design, Flair Hot Numbers resembles the look of a basketball on fire. This distinct card has long been a collector favorite and commands prices north of $800 for high-grade copies. With odds of 1:90 packs, the card prices may seem high but the checklist features 20 cards, so the Michael Jordan only falls 1:1,800 packs. Borderline obnoxious, Michael Jordan's Net-Rageous insert does not go quietly into the night. The heavy use of green forms a bizarre background and is combined with a font that evokes memories of airbrushed t-shirts. 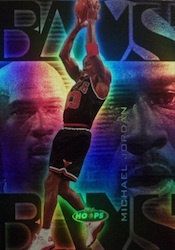 While still a tough pull at 1:2,880 packs, high grades of this Michael Jordan insert can be found in the $200 range. Loud and proud, Michael Jordan's Big Men on the Court card is one of the most defining inserts of the era. It walks the line of being cartoonish while still managing to work. Known to collectors simply as BMOC, the Jordan version falls at 1:2,400 packs. In addition, a very rare "Z-Peat" parallel features a chrome finish and almost impossible odds of 1:11,200 packs. There are Jordan inserts and then there is the 1997-98 E-X2001 Jambalaya. 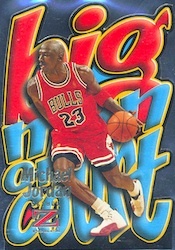 Arguably the most popular Michael Jordan insert of all-time, when this card surfaces, huge dollar amounts follow. The value can be directly attributed to the extreme rarity of the card, which sits at 1:10,800 packs. While it is a tough insert to find, it's the unique design that puts this card high on many wish lists. 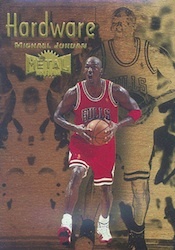 1997-98 Metal Universe Platinum Portraits use small holes to achieve a pixelated profile shot of Michael Jordan and the all-silver color scheme gives the impression of a metal card. Graded copies are pushing toward the $1,000 mark and you can expect to open at least 4,320 packs to pull one of these rare cards. Gold? Check. Jordan? Check. Valuable insert? Check. Sometimes that is all it takes to make a winning card. A full-color image of Jordan is set against a washed-out gold foil background, making a nice looking card. Similar to almost every card on the list, Jordan's Championship hardware card is another very rare Michael Jordan insert. This particular card can be found at around 1:5,400 packs. 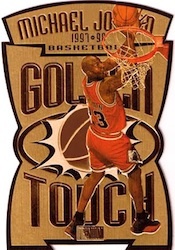 The 1997-98 SkyBox Premium Golden Touch is not the first version of this insert but it is certainly the rarest. 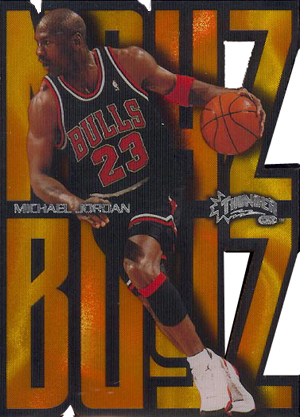 Dropping at only 1:5,400 packs, this Michael Jordan die-cut insert card also makes good use of a gold color scheme. Of late, the card has been selling in the $400-$700 range. Michael Jordan's 1997-98 Ultra Court Masters insert utilizes a background with a hardwood court effect and dual images of Jordan. While the card itself feels a little cluttered, the idea is appreciated. Collectors have certainly taken notice of this rare card that falls 1:2,880 packs. 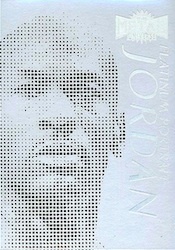 Michael Jordan is the ultimate example of an NBA star and this insert aims to acknowledge that with a silver star background. If this rare card (1:2,880 packs) does not have enough of a wow factor, there's an even rarer parallel that has a multi-color gold finish. The appropriately named Ultra Stars Gold parallel represents only 10 percent of the entire print run. Dunkin Donuts has the word "dunk" in it. Basketball players regularly perform dunks. I get it. Collectors do too as this popular card sells well despite appearing at a rather reasonable 1:720 packs. 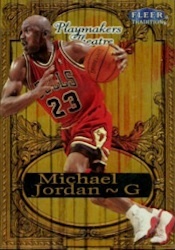 Michael Jordan's 1998-99 Fleer Tradition Playmakers Theatre card is a very special insert. This is not only because of it's rarity, but also due to the fact that it is serially numbered to just 100 copies. As cards emerged from the late 1990s and pushed into the new millennium, serial numbering took hold and became a common occurrence in the current collecting world. The card design is actually quite ornate and makes good use of the gold foil and embossing. Collectors should be aware that there are versions which are not numbered and not embossed. These versions, which were not inserted in packs, are not nearly as valuable . 1998-99 SkyBox Thunder Noyz Boyz is another unique die-cut in the same vein as Big Man on Court. 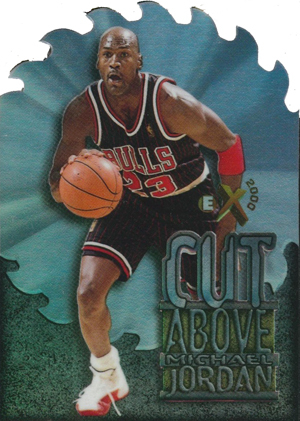 Despite questionable spelling choices, this Michael Jordan insert card is very popular and is hard to find at around 1:4,500 packs. This combination of popularity and rarity has resulted in sales in the $750-$1200 range. The only other serially numbered card on the list is the 1998-99 Hoops Bams card is limited to 250 copies. 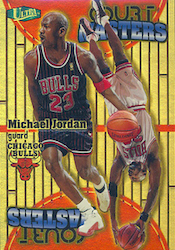 The card features three separate images of Jordan in an admittedly convoluted design. A more limited "Slam Bams" parallel features a gold finish and is numbered to 100. 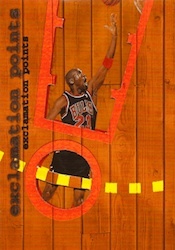 Last, but certainly not least, Michael Jordan's Exclamation Points insert features a removable case that is still part of the card design and gives the card two distinct looks. 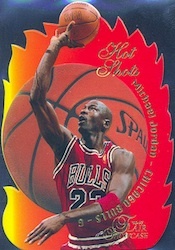 This rare Michael Jordan insert can be found 1:4,320 packs. Great list, but you are missing the 1997-98 Upper Deck Game Jersey Signature Card. 92-93 Stadium Club Beam Team inserts were NOT inserted 1:36 packs. They were far more rare than that. warren wolk � I am fairly certain those odds are correct as I have pulled several myself. The Beam Team inserts average about one per box in Series 2 and it is not uncommon for two to come in a single box. 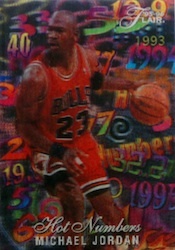 What’s a MICHAEL JORDAN LIMITED EDITION 22 Kt G0LD PRINTERS PROOF CAREER COLLECTION worth? We have a lot of these in the Philippines back in the 90’s> Im just wondering why The Skybox Autographics is not included. Ronald Allan � As noted in the article, the list does not include autographs or memorabilia cards. Also, Jordan was never included in the original Autographics run. He only signed Autographics cards once Upper Deck acquired the Fleer brand.